The car was differentiated from the division's New Yorker sedan by its bucket leather seats (the New Yorker had a bench seat) and standard features such as alloy wheels that were options on the New Yorker. Further differences between the Chrysler LHS and its New Yorker counterpart were a floor console and shifter, five-passenger seating, lack of chrome trim, an upgraded interior and a sportier image. From the 1996 model year on the New Yorker was dropped in favor of a six-passenger option on the LHS. The LHS received a minor face change in 1995 when the corporate wide pentastar emblem was replaced with the revived Chrysler brand emblem. Standard features of the LHS included a 3.5 L EGE 24-valve 214 hp (160 kW; 217 PS) V6 engine, body-colored grille, side mirrors and trim, traction control, aluminum wheels, integrated fog lights, 8-way power adjustable front seats, premium sound systems with amplifiers, and automatic temperature control. Unlike the New Yorker, leather seats were standard. MY 1995: The headlamps on the 1994 models were poorly designed, Chrysler received complaints about their poor brightness, and rushed the redesign into fall 1994 production for 1995 models. MY 1995: Redesigned a projector-style headlight beam, which was rather uncommon for its time. A new Chrysler medallion on the grille replaced the pentastar. MY 1996: Body color mirrors were no longer available, as well as the optional carphone. With the withdrawal of the New Yorker, front bench seats became optional. Homelink garage door opener and a hidden antenna became standard equipment. After a one-year hiatus, a redesigned LHS was introduced in 1998 for MY1999. It featured the new winged emblem of the Chrysler division. With the introduction of the 300M and the discontinuation of the New Yorker, the second generation LHS competed with traditional large luxury sedans such as the Lincoln Continental and Toyota Avalon while the shorter and sportier 300M competed in the performance luxury market. The new generation of the LHS was much more refined than its predecessor, and its 3.5 L SOHC 24-valve V6 produced 253 hp (189 kW; 257 PS) @ 6400 rpm and 255 pound force-feet (346 N⋅m) of torque @ 3950 rpm. However, the second-generation LHS received a Poor rating in the Insurance Institute for Highway Safety's moderate overlap crash test in 1999. 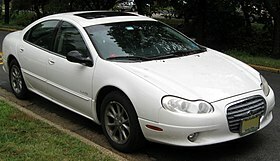 In a confusing move, Chrysler discontinued the LHS after 2001, replacing it with the new Concorde Limited. The Concorde's fascias, the only exterior difference between the Concorde and LHS, were replaced with the LHS'. In effect, the LHS was rebadged as the Concorde. The first-generation LHS, sold in Europe with the New Yorker nameplate during the 1995–1997 model years, featured rear amber turn signals, rear fog lights, side turn signal repeaters, lack of side markers, and headlamps that incorporated different lens geometry and bulbs. The first generation LHS was praised by motoring journalist Jeremy Clarkson, who is well known for criticizing American automobiles, described the LHS as "by global standards, right up there with the best." The LHS nameplate was discontinued after 2002, but the design continued as the Concorde Limited. ^ "Used Chrysler LHS Luxury Cars". intellichoice. Retrieved November 7, 2014. ^ "2002 Chrysler Concorde Sedan". Edmunds. Retrieved November 7, 2014. ^ a b "Creating the second-generation Chrysler LHS and the Chrysler 300M". allpar. April 2014. Retrieved November 7, 2014. ^ a b c Anderson, Greg (January 1, 1999). "1999 Chrysler 300M and 1999 Chrysler LHS Road Test". Edmunds. Retrieved November 7, 2014. ^ "1993–1997 Dodge Intrepid, Eagle Vision, and Chrysler Concorde, New Yorker, and LHS". allpar. Retrieved November 7, 2014. ^ Clarkson, Jeremy (2009). Motorworld. Penguin. ISBN 9780141901367. Retrieved November 7, 2014. Haynes Repair Manual – Chrysler LHS, Concorde, 300M, Dodge Intrepid, 1998–2004. Haynes. ISBN 9781563927324.